Wooden key with two tangs, and a hole in the handle for attaching a cord. 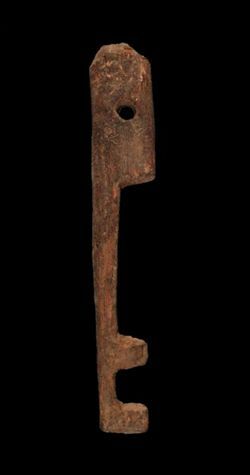 The introduction of lock and key is one among several important changes in daily life in Roman Egypt. Previously seals had been used to check that items and documents were kept untouched. This example comes from the only city founded in Egypt by the Romans, Antinoopolis in Middle Egypt, created by the emperor Hadrian at the site where his lover Antinous drowned in AD 130. In the Byzantine Period the city was capital of the province of Upper Egypt, and therefore at the forefront of changes in material culture.